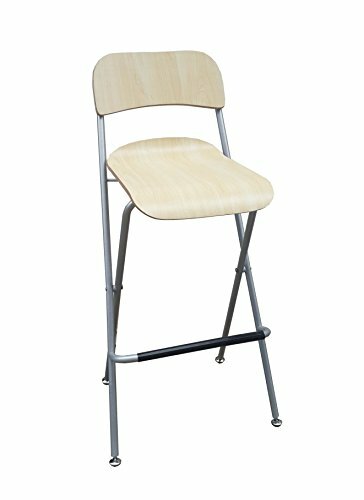 Folding Bar Chair is popular for bars, stores and households. Seating and backrest are made of wood, folding chair frame is made with metal tubing. Metal is powder coated silver. Wood clear coated. Footrest is made of metal tubing with rubber grip. Chair dims: width: 21"; depth: 16"; height: 41"; seat width: 13 3/8"; seat depth: 14 1/8"; seat height: 29". Back seat is made of birch veneer plywood bent to shape. Footrest has rubber protector. Chair tested for 243 lbs. Price is for two in one box. This is the minimum selling unit. Fast shipping!